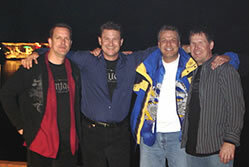 We are first and foremost a rock and roll band - a retro rock experience. We love to play music that makes people feel good and have a great time. Whether that is in a nightclub, party, or a charity event, or just about any other opportunity where we can plug and play. We present songs that people recognize, and love to sing and dance to. When you leave a Vintage show, we want you to leave happy, having had a great time.